Wow, Christmas is coming quick! Very happy to say there are actually some flakes falling and the driveway is white. Though looking at the forecast it likely won't stay. I really want the snow to come and stay. I'm tired of everything being brown and dead -November is only supposed to last one month not all winter. And I REALLY want the mud to freeze! All those people on the news saying they want this weather to stay all winter obviously live their lives on pavement/cement. Our yard (which to farmers means the dirt part of the yard not the grass) is such a mess. Colin was trying to smooth out the ruts before it does actually freeze. And needless to say Ella is such a mess when she plays outside. 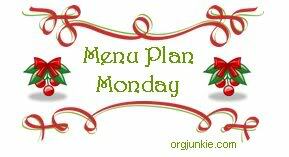 What's cooking at I'm an Organizing Junkie?